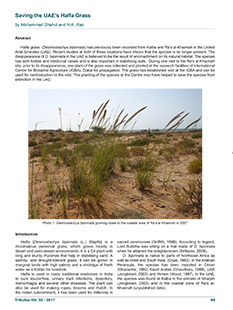 Halfa grass (Desmostachya bipinnata) has previously been recorded from Kalba and Ra’s al-Khaimah in the United Arab Emirates (UAE). Recent studies at both of these locations have shown that the species is no longer present. The disappearance of D. bipinnata in the UAE is believed to be the result of encroachment on its natural habitat. The species has both fodder and medicinal values and is also important in stabilising soils. During one visit to the Ra’s al-Khaimah site, prior to its disappearance, one plant of the grass was collected and planted at the research facilities of International Centre for Biosaline Agriculture (ICBA), Dubai for propagation. The grass has established well at the ICBA and can be used for reintroduction to the wild. This planting of the species at the Centre may have helped to save the species from extinction in the UAE.